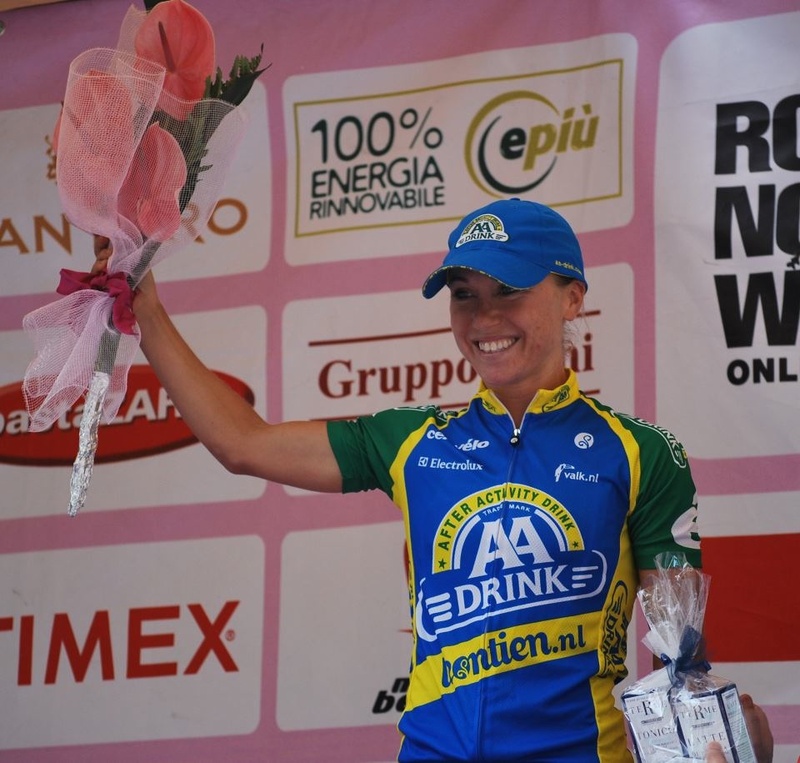 The 2012 Women’s Giro d’ Italia was a success for both my team, AA Drink/Leontien Cycling, and myself. I have always loved this race, since I first participated in 2009. It is a true classic and, for me, the most prestigious and challenging race on the women’s UCI calendar The race allows us as riders to see so much of Italy, from the south to the north and all in between. In just one week and a half, we covered almost all of the Italian countryside. This year’s tour had us changing hotels every night except for one. This meant that we would wake in the morning, eat breakfast, transfer to the start, race 3-4 hours, transfer to the next hotel, eat dinner, and sleep. Every morning we would do exactly the same thing. Wake, eat, race, drive, eat, and sleep. There really wasn’t much time to do anything else. This type of race really teaches you how to find your rhythm of racing. It allows you to practice over and over again, the little things that go into preparation for the race and recovery after, because you do it over and over again. You almost become like a machine, moving through the steps like a robot by the end of the tour, as the fatigue starts to set in. 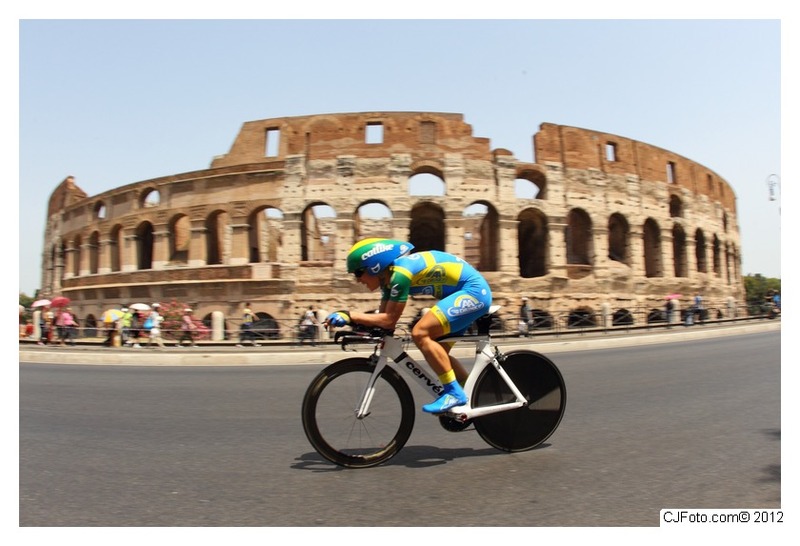 I found the 2012 Giro to be challenging, but I think it provided opportunities for all different types of riders. There were sprint days, climber days, breakaway days, and a short time trial. I truly enjoyed each day of racing because I was a part of team with someone for every type of terrain. The race started with a very long, very hot race out of Napoli. We started with a 7km neutral, which lasted 30 mins. This was followed by a 140 km flat stage. Everyone finished on the same time and the race ended in a massive bunch sprint. I was 2nd in the final and found myself very close to the victory, so this would fuel my fire to win in the next stage ending in a field sprint. The second stage was a short 7.2 km time trial. I was sitting second on GC, so that added a little pressure, but I felt good about the course and was excited to race. 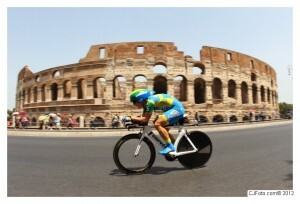 It was very technical with lots of places to accelerate and change speed, so it was a good course for a sprinter. I started and I knew immediately that I was giving it my all. My lungs hurt and my legs were burning from start to finish. When I finished, I heard them announce my time as 3rd best, with only one rider to go. 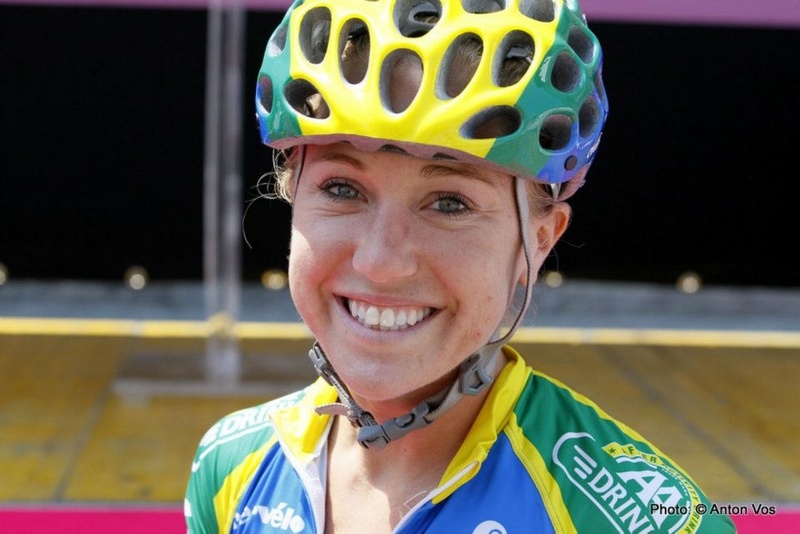 Well, that rider happened to be the best rider in the World, Marianne Vos, so I didn’t expect to hold on to the podium. She finished first, 5 seconds faster than 2nd place and 15 seconds faster than me. I watched the video of the stage later that night and I learned a few things about time-trialing just watching her race. I could see how badly she wanted to win. In every moment, in every pedal stroke, she was fighting for the win like her life depended on it. This is the style of a champion. The next few days took us into the climbs where I would be supporting my GC rider, Emma Pooley. I would try to put her in position before the climbs, keep her out of the wind, maybe try to establish a breakaway for her benefit, or keep the race together and controlled, so that she could do her thing when the big climbs and decisive moments came. Emma moved into 3rd on GC over the next two stages and the team was happy but anxious to help her try to win. Stages 5 and 6 were flat days. Stage 5 turned out to be a sort of recovery day for most of us. A solo break went up the road shortly after the start and she gained 12 minutes on the field at one point. Everyone was content to let her go and our team did not want to take the responsibility to bring her back. So, we played poker and she rode away. The sprint for 2nd was a bit chaotic and I sat this one out for safety. Stage 6 turned out to be a stage I will remember for a very long time. It was a difficult stage with some rolling terrain, lots of attempts at a breakaway, and many times where there were splits in the field. I was in the breakaway early in the stage, for about 20km until the team of the leader brought us back. Then it was a series of attacks until the finish line. I had no idea what the finish looked like, I only knew that the signs from 3km to go were generally accurate. So, I focused on staying near the front and watching the km signs until the finish. In the last 3 km I had some help from my teammate, Sharon Laws, keeping me in the front and protecting me from the wind. With about 1 km to go, she dropped me off on the wheel of the sprinters and I followed wheels to the line. I was in a perfect position with 200m to go and was able to pull off what might be the biggest victory of my career. I was ecstatic. The best thing about the victory was that it was the 4th of July and I was winning not just for me, but also for my country. It was an incredible feeling. Check out this video to see the sprint. Stage 7 was back in the climbs, but I had a goal to try to be in the breakaway and I worked really hard to do that in the beginning of the race. After about 30km the break was established and I was in it. We were 12 riders and we stayed away for almost the entire race. However, we were caught just before the final climb and I was totally cooked when the lead riders caught us. I just survived over the climb and rode easy to the finish line. My job this day was to be in the breakaway to support my teammates behind and allow them not to work. This would give my GC rider an opportunity to try to win in the final climb, having not had to work or control any breakaways for the first ¾ of the race. Stage 8 was a bad one for the team. It was a hard race from the beginning with some small circuits for the first 50km that included lots of climbs and up and down terrain. The field split in two pieces after the first 10km and we lost 2 of our riders. After the heavy part of the race was over, it was mostly flat to the finish, but the GC riders had something other than a field sprint in mind. The 3 GC leaders that were most dangerous to our GC rider attacked in the last 20km and we missed the move. So, we were in the unfortunate position of having to chase in the last 15km and not able to focus on another field sprint. We put our whole team on the front, except for me in case the break came back, but it wasn’t enough to bring them back. Three riders finished 40 seconds in front of the chasing peloton and I won the field sprint for 4th. But it was a bad day for us as a team and there was no celebrating afterwards. We had things to discuss in our meeting. The best part of making the mistakes we made on stage 8 was that we were able to correct them on the last day of racing in Stage 9. Emma Pooley was not happy with the result of the day before and she was ready to make it up to her team. The race was 110km with three climbs. Our goal again was to make a breakaway and have some teammates up the road when our GC rider came across with the other leaders. Today my legs felt like logs. They were so tired and painful. Every acceleration I made, had them loading up with lactic acid and it didn’t go away. It lingered in my legs for minutes after I stopped pushing. But I knew I only had one day left and that if I did my job, I would be helping my team. So, I attacked and attacked and attacked in the first 20km until the breakaway was finally established. This time though, I wasn’t in it. I had 2 teammates in the break and another one bridging the gap. So it was a group of 15 riders and we had 3 in it. This was a success. The break rode hard and survived the climbs until the leaders caught them in the last kilometers. One of my teammates, Lucinda Brand, was able to set up Emma for the perfect attack. This attack would be the decisive move of the race and the one where she moved herself from 3rd GC into 2nd. She was third on the stage and finished the tour with the Mountains Jersey. 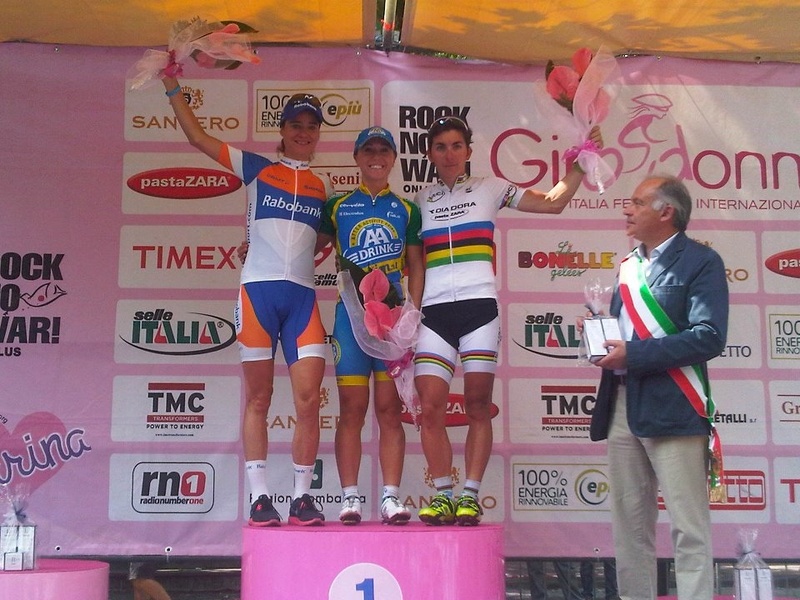 When the Giro was finished, we had a stage win, 2nd GC, and the mountains jersey, as well as a number of podium finishes. It was a success for the team. Even though we had some ups and downs, and made some mistakes along the way, we finished the tour on a positive note and we all walked away very satisfied with our work as a team. For me personally, my goal for the 2012 Giro was to win a stage, support my team for our GC ambitions, and use the race as preparation for the Olympic Games. 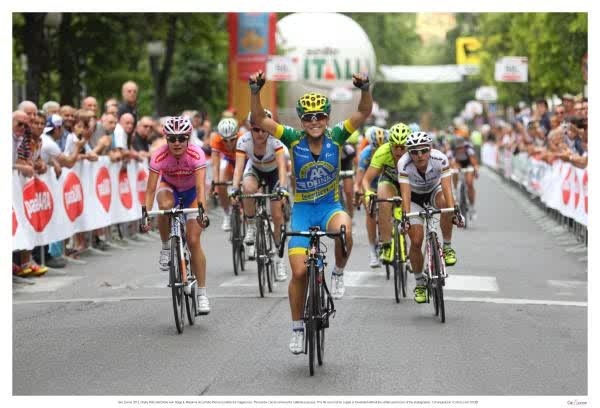 I did not expect these goals to be easy to achieve, but in the end I got exactly what I needed from the Giro. And I am happy and ready for London!! !